Solar Panels in Ireland are an ideal clean renewable energy solution for heating your domestic hot water, the sun is free, will never run out and is ultimately the most renewable energy source there is. s a carbon-free, renewable alternative to the power we generate using fossil fuels like oil and gas. Basically the energy form the sun’s rays is collected and used to heat a fluid which then transfers heat into your hot water cylinder much like your existing system. Solar Panels Ireland hot water systems are designed to meet a percentage of your overall hot water requirement over the year. According to independent studies conducted by the SEAI; in a typical dwelling, this is usually 50% to 60% of the annual hot water requirement. We typically design our systems to produce 60% or more. 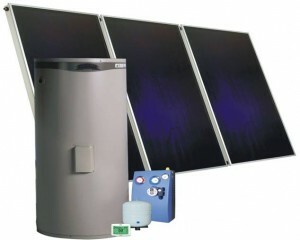 The higher your hot water needs, the more beneficial a solar hot water system will be as more ‘free energy’ will be used. 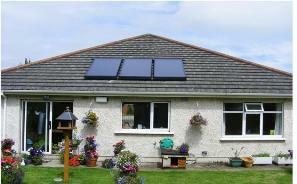 Solar Panels Ireland hot water systems are usually made up of two main components these are, the solar collector array (your solar panels) and the solar cylinder which is very important as it provides efficient storage for the free heat which your solar panel Ireland collectors have produced. IS YOUR HOUSE SUITABLE FOR A SOLAR PANEL INSTALLATION? Yes! Solar panels can be installed on nearly any house. If there is a south facing aspect that is the first place to look at, other wise East or West facing roofs can be used as well. The easiest installation for Solar panel collectors is facing south as they will receive optimum amounts of solar energy if they move away from South to East or West we just need to install a slightly bigger solar panel. Generally, as a rule of thumb, anywhere between 30-45 degrees is optimal for the tilt angle. Deviations from South to SE/SW will only affect output by approximately 5% so we don’t need to make any changes if this is the case. It is important to add to the required amount of collector area to compensate for any expected reduction in energy due to the mounting position, location or for reductions due to shading from trees etc. With regards planning permission the total solar panel collector area must not exceed 12m2 or 50% of your total roof area. HOW DOES SOLAR PANELS IRELAND THERMAL TECHNOLOGY WORK? 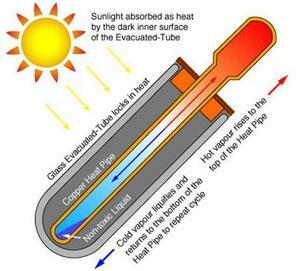 When the solar panel absorbs heat from the sun, a pump turns on and moves heat from the panel into the cylinder via the lower coil in the cylinder. When the solar panel is unable to heat the entire contents of the cylinder (in Winter) the back up boiler provides a top up heat through the top coil. HOW SUITED IS IRELAND’S CLIMATE TO SOLAR PANEL TECHNOLOGY? Very suited – Ireland’s solar resource is approximately 70% of that in the Mediteranean meening we only need to add 30% extra solar collector area to achieve the same energy output as if you had a system in Spain! To get more technical horizontal flat plain surfaces receives on average 1100 kilowatt hours (kWh) of solar panel energy per year in Ireland. This Solar Panel Ireland energy is provided by both direct (35%) and indirect sunlight (65%) so when our skies are overcast. Indirect sunlight is that which bounces off clouds and water droplets etc.. in the air as it travels to earth and as such is the more common type we experience in Ireland. Our Solar Panel Ireland collectors are designed to work in indirect sunlight conditions so are ideally suited to Irish solar conditions. To give you an idea of what these panels can produce a 6m² Flat Plate Solar Panel Water Heater in Ireland can provide the energy equivalent of an electric immersion heater running for almost 2 hours on average, every day, 365 days per year. The bulk of this solar energy is delivered from May to October but temperatures of 30 Degrees C are common in Winter meaning your central heating system only has to bring the temperature up to 38 degrees or so so you can have a nice hot shower. CHOOSING THE RIGHT SOLAR PANEL INSTALLATION PROVIDER? The Solar Panels Ireland supplier/installer should be registered with SEAI to install solar panels and thermal hot water systems. 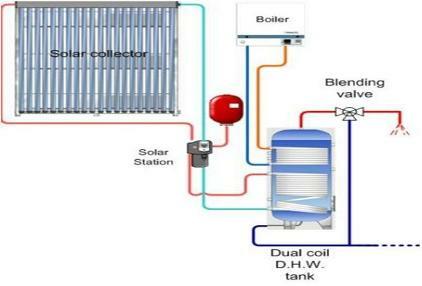 Once the solar panel thermal system have been installed and set up to operate at optimum capacity, they should provide you with all the necessary instructions to both understand the and monitor the system. You should request a user instruction manual in English and a full run through on the operation of the system. Hotfoot have a nationwide network of installers who we have worked with for over 8 years now. Wherever you are in the country we can have an installer visit you asap to perform a site survey and give you a no obligation quote to install your solar panels. There is a lot of discussion about which solar panels are the best for Ireland. The question should be really which is the best for you? All solar panel systems can be designed to produce the same amount of energy but different installation and operating methods and costs influence which system will suit you – beware of the supplier who claims his system is the best- it all depends..! Because of this we supply all sorts of different types of solar panel so feel free to give us a call to discuss your options. In the meantime we have a,listed a few of the main pros and cons of each system below. Assess the energy requirement by occupancy. How many people utilising the Domestic Water Supply? Be exact or rule of thumb of 50L – 100L per person per day. Size of the hot water cylinder will influence the size of the solar panel array. After establishing the requirements, Hotfoot will recommend either a Hailin Flat Plate Solar Collector, Kingspan 1400 Evacuated Tube or a other suitable solution from Ecologics Solar designed to meet your property needs. Solar Panels Ireland – Applicable for SEAI GRANTS with a €1200 Grant available against our Solar Systems which are registered under the SEAI Better Energy Scheme.